After my last post on healthcare costs I was asked whether I could put data on some individual conditions together for a comparison between Britain and the US. And when I did one thing leapt out at me – hospital bills in the US are something the hospital expects you to haggle with. Do so! Average hospital costs for given conditions haven’t always been available – indeed it was only Obamacare that brought them in. As it’s retrospective it’s currently only available for 2011 and 2012. 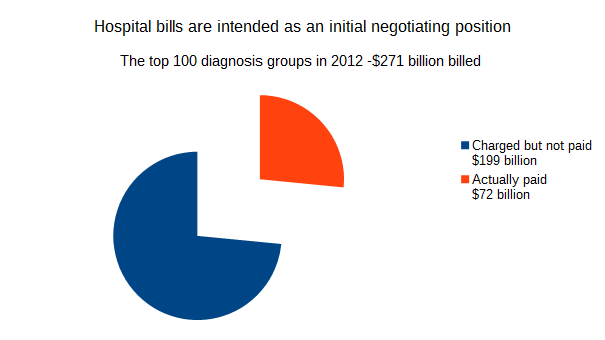 And then only for the top 100 diagnosis groups – which is still better than nothing. But there are separate columns “average covered charges” (i.e. what the hospital bills for) and “average charges received” (i.e. the income the hospital receives). And they are starkly different, with 98% of cases receiving between 21% and 30% of what they charge (and the remaining two cases being 32% and 37% for alcohol or drug dependency without rehab and psychoses respectively). When the average is in that range, they know that they are establishing a negotiating position. Medicare and insurance companies know it’s a negotiating position. But the average patient does not, meaning that those without experts to argue for them are likely to pay much higher prices. And the cheaper your insurance the less likely it is to go out to bat to save you money. British prices are available online and my last post on healthcare costs explains how to use them. The Healthcare Blue Book is the most user friendly American source I’ve found. (If anyone has other sources I’d be delighted to add them). And for an indication of how much potential savings there are, I matched US healthcare prices against UK ones – with the methodology here.